Exciting Cozumel Parasailing Excursion - Tandem Too! Parasailing is one of the most popular beach activities on Cozumel. You're pulled behind a speedboat at high speed, so that with the aid of your parachute, you rise high in the air, hundreds of feet over the water, where you'll float effortlessly and silently, gazing at the panoramic vistas of Cozumel island and the beautiful blue Caribbean Sea beyond. Don't forget your waterproof camera or portable binoculars - the view is breathtaking! Now we offer double seat parasailing, so you can share the experience with your friends or family, a thrill you'll all remember! Fly like a bird hundreds of feet above the beautiful Caribbean Sea! Enjoy panoramic views of the Cozumel coastline - don't forget your waterproof camera! 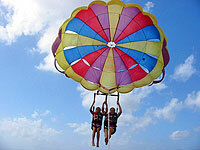 Share the experience with your friends or family - do a tandem parasail! Cruise Passengers: Yes! This tour makes a great shore excursion. Located conveniently downtown, you can combine this with a Glass Bottom Boat Tour or just hang out downtown shopping and hitting the bars! When: Monday to Saturday from 9:30 AM to 3:00 PM. Where: Pickup from the Aqua Safari dock on the waterfront, 1 block from the ferry pier, between 5th and 7th streets South. How Long: Approximately 10 Minutes. Restrictions: Minimum weight is 70 lbs. Maximum total weight is 300 lbs. Tandem is available on the day of service, weather conditions permitting. Just book for 2 people. Kids: No age limit - we respect your judgment. Kids are the same price as adults. Observers: If there is space available in the boat, an observer can ride along for $20.00 per person, paid in cash on the day of the tour. There usually is space on the boat, but not always.